Recently, I read an article in a magazine about pantry organization. 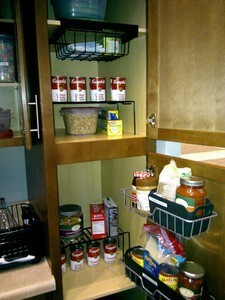 The main point was the fact that keeping your pantry organized saves shelf space, time, and money. Examples were provided showing how canned goods should be stored on lazy susans and packaged foods should be placed in baskets or taken out of the package and placed in airtight containers (…which extends shelf life). Believe it or not, an organized pantry encourages you to cook healthier foods! 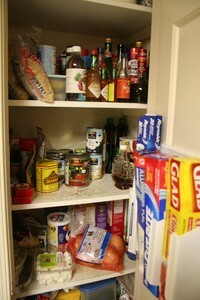 After reading that article, I looked in my pantry and decided that it needed to be reorganized. Unopened foods with an expiration date a few weeks away – to be donated to the local food bank. Items with an expiration date that had passed were tossed in the garbage. My next step was to wash down the walls of the pantry with Trisodium phosphate (TSP). This product will cut through even the toughest grease and also through soot and lead paint dust. It can be purchased at most hardware stores and requires very little elbow grease to get the job done. Magic Erasers work wonders at removing scuff marks from boxes and containers that have scratched the walls of your pantry! After the ceiling, walls, and shelves of the pantry were clean and completely dry, a fresh coat of paint was in order. I used Cabinet Rescue which is a waterborne acrylic enamel. It’s a melamine laminate finish that protects walls and is easily cleaned. I allowed it to dry overnight before continuing with my pantry organization project. Next, I put all dry goods in Tupperware airtight containers. Included was sugar, flour, macaroni, spaghetti, cereal, coffee, tea and a wide variety of other food items. I used Tupperware Modular Mates and square containers because they take up less room and are stackable. Clear containers are best because you can always see what’s inside without having to remove the lid. Once I had everything organized in containers, then I put less-used items on the top shelf. Within the canned grouping, I made other groups: soups, vegetables, and tuna. Each group was given a specific spot. My pantry is big enough that a large bag of dog food can sit on the floor in the corner and not impede access to other foods. This makes for easy access when it’s time to fill the dog’s food bowl. The arranging of groups can be done any way you like! The more you reduce dead space in your pantry, the better organized your pantry will be. And remember: first in, first out. 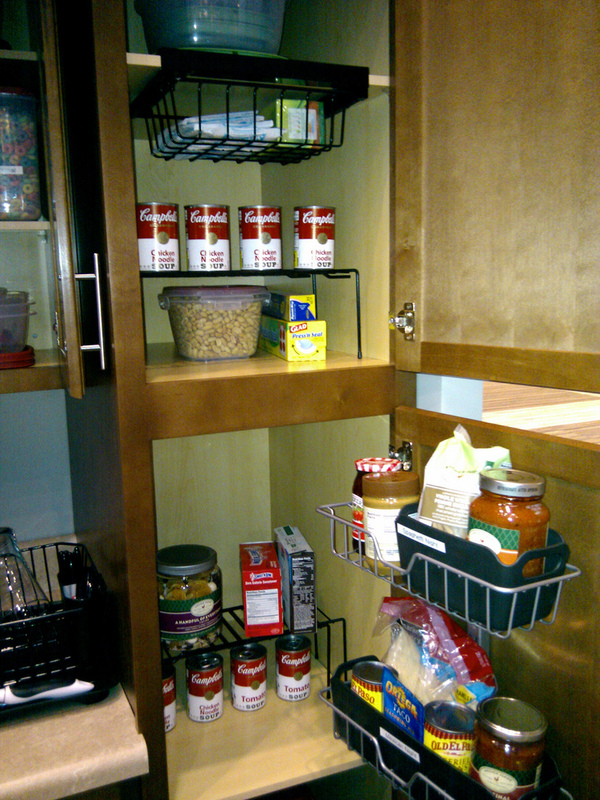 Pantry organizers are a lifesaver. You won’t believe how much easier life is when there’s a specific place for everything in your pantry! 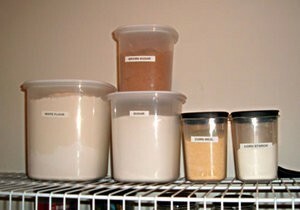 Airtight containers are a good investment, so be sure to buy all that you will need to keep your pantry well-organized. With an over-the-door spice rack hanging on the pantry door, all you have to do is open the door and all your spices are right at your fingertips! Other types of over-the-door organizers are also available — like this pocket organizer which can also be used to store & organize things in the pantry. I bought storage baskets (or bins) for my pantry and stocked them some with snacks — such as fruit, pudding & jello cups, and other healthy snacks. When my grandsons visit, they know exactly where to look for a quick and healthy snack. After my pantry was completely organized, then I made a list of things that I needed to have a well-stocked pantry. Then, I went grocery shopping. us: everything is easily accessible as soon as I open the pantry door!